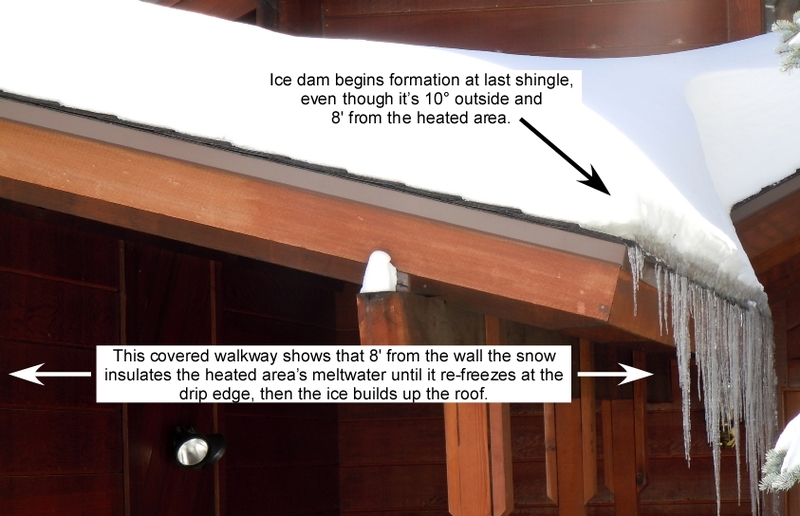 Ice dams begin to form where the meltwater exits the snow at the drip edge. They then build upward to the wall line, create a standing water condition, and interior leaks result. Snow is a great insulator that enables meltwater to flow even across this 8′ unenclosed, unheated overhang shown below before re-freezing at the drip edge. Left unabated an ice dam will, of course, build up the roof and create ponding water above the wall line that will leak. Radiant Edge stops ice from forming as meltwater exits the snow at the edge. Stop it from forming at the eave, and you’ll stop it from proliferating up the roof. The well-intended but obsolete methods of roof heating from the drip edge to well inside the wall line stem from an old school of thought. Exposed zig-zag heater cables were the original attempt at ice dam abatement. They were installed from the eave edge in a zig zag fashion to provide a melt path through the developed ice dam to help prevent leaks. They do not prevent ice dams nor icicle formations and often exacerbate ice problems along the eave. Do think twice when considering an ice melt system that heats a large portion up the roof. They are not only expensive to purchase and install (they require you to remove and replace your roof), but the monthly power consumption is also excessive and unnecessary. Radiant Edge’s patented technology focuses on where ice prevention is needed: right at the eave edges and valleys. This roof to the right is amid 15* temperatures, and the entire neighborhood is fraught with ice dam formations. We’ve optimized heat transfer efficiency to the melting surfaces while minimizing heat loss downward to the roof deck. That’s why our products use much less energy than the competition. We have the smart design because we follow the Four Rules Of Thermodynamics.